Indian children are traditionally woken up by their parents in the off fan mode. Our parents don’t urge us to get up early in the morning nor do they argue with us because there is never a NEED. They have their weapon – the SIMPLE task of switching of the room’s AC and fan and then just leaving the room shutting off ears to all our cries and pleads. I smiled bright blushing my cheeks and wished my own self . It might be insignificant to most of you but yes for me it is a BIG DEAL. I still remember the day I had finally decided to blog and the numerous fears that had pounded me. Thoughts like what if no one likes my writing or what if I can’t write or what if I write something foolish and the list is endless. 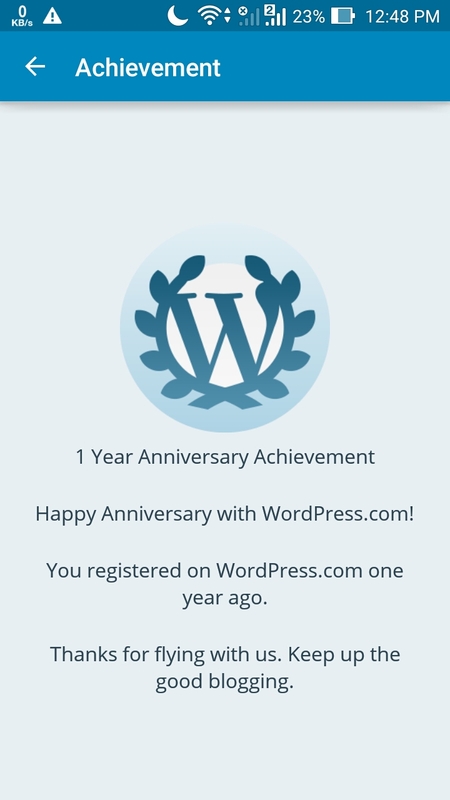 Even after starting my blog I had hesitated for over a month before sharing the news with my friends and family. It took me a lot of effort and self hypnosis to force myself to actually face the world. I mean yes those fears are still alive and I still hesitate before writing a post but a major of them have diluted over this one year. I have learnt so many things through this little effort of mine that I never could stop feeling good about myself. I had started off as a novice, unknown of the world I was heading to. I had no idea what I would be taken to or what I wanted from all this. It was similar to being a child again where you are just unaware of the things that you will learn and with no purpose in mind you just gravitate yourself to a self enlightening journey. My first step was right, now what further? I stumbled onto this beautiful concept of ZEN BUDDHISM which talks about the Beginner’s mind or SHOSHIN. It talks about the innocence of being a learner or a starter and the vice of pre-conceptualization by an expert. elevate your mind to the position of understanding that alien concept so much so that you gather it in your limitless mind and thus transfer it in your knowledge you somehow become an expert in it …maybe less, maybe more! disaster of becoming an expert. In simple words a PRIDE drops in and most of us are unaware of it. We quote it to be our learning but it actually substantiates into a closing or a suffocated way of thinking. The more we learn the more closed we become because of the owning of the knowledge. We stoop ourselves into thinking ” I already know this and my way is the ONLY way”! And thus whatever we listen about that concept, we listen to agree or disagree depending on whether it matches with our predefined beliefs. As they say WE HEAR TO REPLY AND NOT TO LISTEN. Most of us have become resilient to updates ! 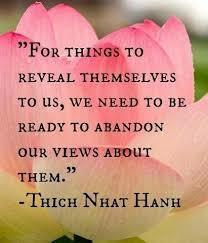 We agree to talks which validate our thoughts and not to those which alter or update them. But what the BEGINNER’S MIND emphasizes on is the fact that once we become an expert in something we learn some percentage of it and to become a better expert in it we need to listen more carefully to gather the remaining. It is more like a puzzle. Once we solve 80% of our puzzle we start believing that it is complete and we start appreciating sources with pieces that match with our findings. But actually what we need to do is to look for compliments or the remaining 20% which would be really different from what we have already gathered and will surely complete the puzzle! It is like putting your baggage on a shelf for sometime and starting as a beginner again free of all pre-conceptions and listening to sources again as if anew. And after that you can still have the previous that you had already gathered plus what you have gained! So basically you end up with a bonus every time you mask up as a child. We just need to remind ourselves daily that we are idiots knowing nothing! And it is really easy to behave that way. I can say that because my sister executes this so religiously! She has this habit of behaving like she knows nothing about something and talks in a way to the other that makes the other feel like they are her mentor. She does this in a playful spirit and every time I slog her for this habit of hers. Never did I know that this unmindful act of hers was something worth appreciating and parroting off. Jokes apart but seriously also, we sometimes need to let go of our desire to add up to what the other is saying. Lets just be silent for sometime and give the other a chance. Maybe that is the reason why our INDIAN sages believed in the concept of MAUN VRAT! Because they somewhere knew that most of us would one day become so consumed by ourselves that we will refuse to give other a chance. And that is why they resorted to such compulsive methods of shutting off human ego. A friendly mischief gaming a foe! Give it a chance, maybe a shorter lane! Maybe you just missed the creamy core! Letting go of the ego you so adore. In learning everyday do we manage to reign. 7 Responses to "BEGINNER’S MIND"
I reckon nothing more compatible than this post can b on in the occasion….very well put. 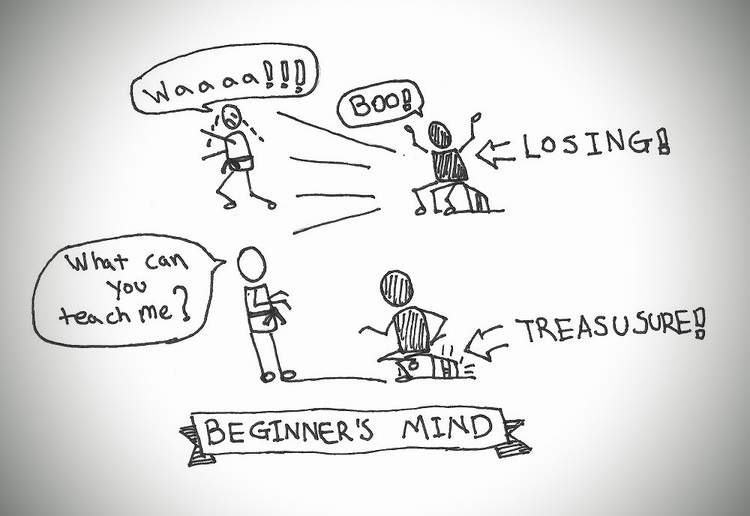 “In the beginner’s mind there are many possibilities, but in the expert’s there are few.” loved this…..awesome one.